(NaturalNews) When the lymphatic system is not working properly, our bodies cannot remove toxins; fight viral, fungal, and bacterial disease; or regulate the amount of fluid in our tissues. In order to achieve maximum health, we must keep this system functioning well and our lymph fluid flowing. It is a complex system that includes organs, nodes, and vessels that perform three primary functions: fluid balance, fat absorption, and immunological defense. When the blood reaches the capillaries, fluid is released from the thin-walled capillaries and flows into all of the tissues in the body. This fluid, called interstitial fluid, bathes the tissues with nutrients and gases as it washes over the cells. The cells absorb nutrients and oxygen and release their waste products back into the interstitial fluid. Ninety percent of the interstitial fluid is reabsorbed by the venous capillaries, to recombine with the blood and flow back to the heart. The other 10% of the interstitial fluid, now called lymph, flows through the lymphatic system and is filtered through the lymph nodes before being returned, ultimately, to the bloodstream. If the lymphatic system is not working properly, interstitial fluid builds up in the tissues, and the lymph fluid is not properly filtered and cleansed before being returned to the bloodstream. The lymphatic system doesn't have a big pump like a heart to force fluid through the vessels. Instead, our bodies rely on our muscles to move the fluid. Our diaphragms and rib cage as well as the blood pumping through our bodies, do assist in this movement. But body movement and exercise is the primary method of moving lymph. A sedentary lifestyle decreases lymph flow by 94%. Lymph contains lymphocytes, (white blood cells: T-cells, B-cells, and natural killer cells) that seek out and kill pathogens. As the fluid is filtered through the lymph nodes, a concentration of lymphocytes clean up the fluid before it is returned to the blood. If the fluid is backed up and not flowing properly, it becomes viscous. The flowing fluid can thicken until it becomes the consistency of cottage cheese. Fluids and waste are not properly drained from the cells, bacteria and other foreign invaders are not properly filtered and destroyed, and disease, including cancer, may result. Be sure to hydrate well with clean (preferably spring) water.Beets, berries, and cherries all stimulate the lymphatic system. A healthy diet consisting of 80% raw vegetables and fruits supports healthy lymphatic function as well as general health. One of Ayurveda medicine's most popular blood purifiers, Manjistha, is known to be an excellent lymphatic tonic. Astragalus, echinacea, goldenseal, pokeroot, or wild indigo root tea are recommended. Detoxifying the blood, hot and cold hydrotherapy, candida cleansing, and rebounding are important components to detoxifying the lymph. So get off the couch, jump up and down, and eat right to detox your lymphatic system. It's the least you can do for a system that works so hard to protect you. 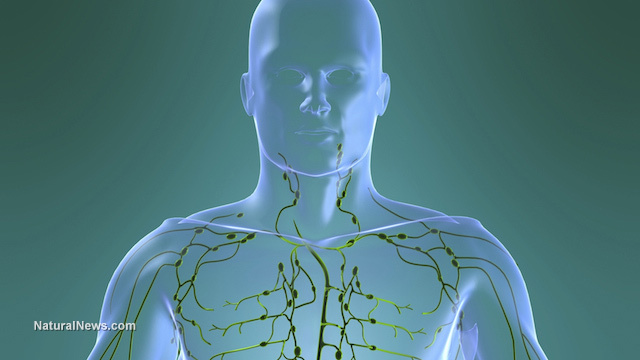 Check out the first source for a more detailed look at the lymphatic system.